For the first time ever! Meet all your favorite Nickelodeon characters in one place! A multiple entertainment panel! Nickelodeon Expo is a first-time happening at Marina Mall Abu Dhabi from August 6th till August 15th. 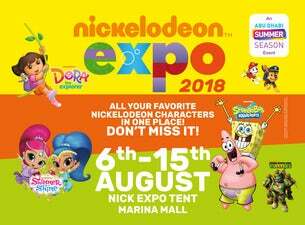 Shows, activities, parades, Meet & Greet and exciting entertainment for the whole family with Nickelodeon’s favorite characters Dora the Explorer, SpongeBob SquarePants, Shimmer and Shine and much more!